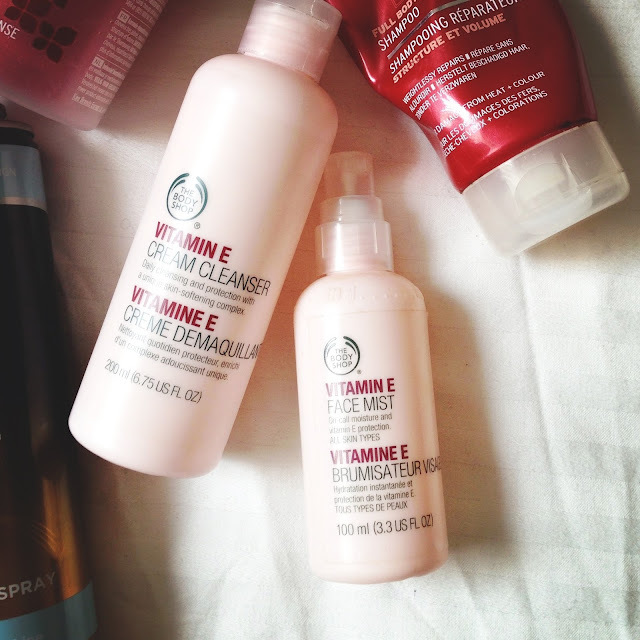 Lets start with the Body Shop products. The face mist I always have a back up of and I am using a new bottle now. It is the perfect spray to set your make up, smells light and fresh and comes out of the spray nozzle perfectly, rather than spritzing your face with water droplets. It is also great to use to perk up your face in the morning before applying make up and I spray it onto my brushes before using them also, so that the bristles are slightly damp. This is a keeper and like I said, I constantly repurchase it. The cream cleanser is also a favorite and I currently have two bottles waiting to be used. I swear by this cleanser and use it to take off my eye make up every night before giving my face a wash. It is delicate and sensitive, although it can sting after a few minutes if you dont then wash it off your eyes. But it takes off every trace of makeup and leaves your face really fresh. 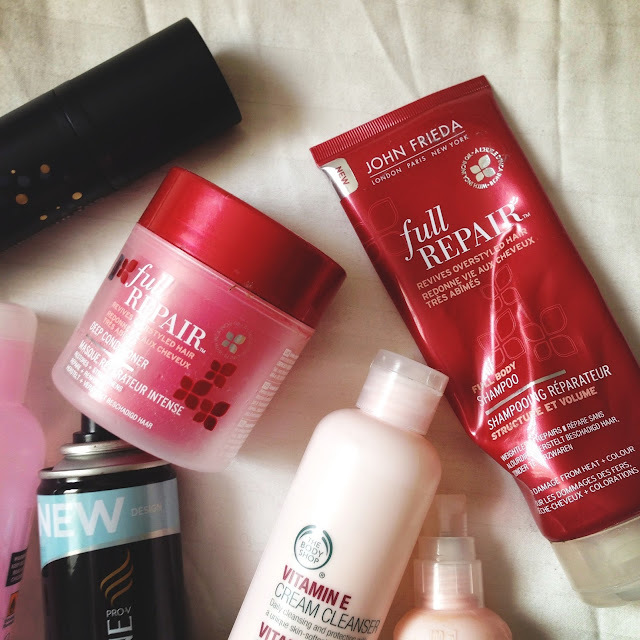 The John Frieda Full Repair are currently my favourite drug store hair products. 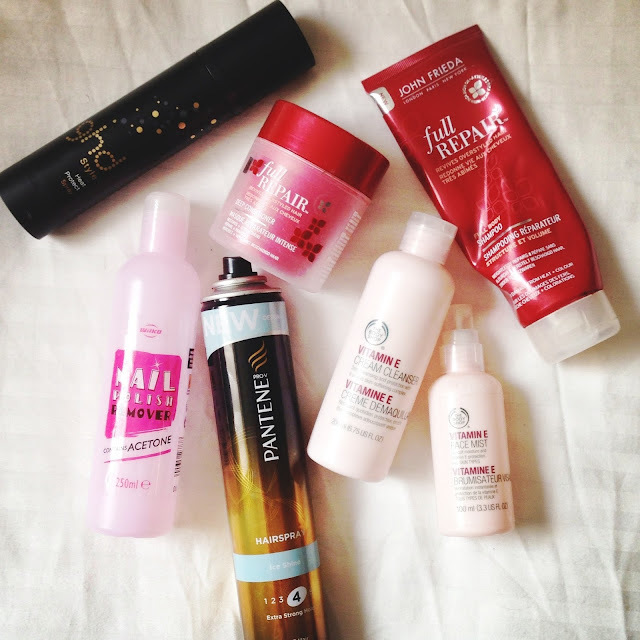 They are brilliant for making the hair feel really clean as well as soft and somewhat repaired. Of course there is no miracle product to actually fix broken hair, but this does help in making the appearance and texture feel 100% better. The deep conditioner especially is fantastic at really giving your ends a silky texture. 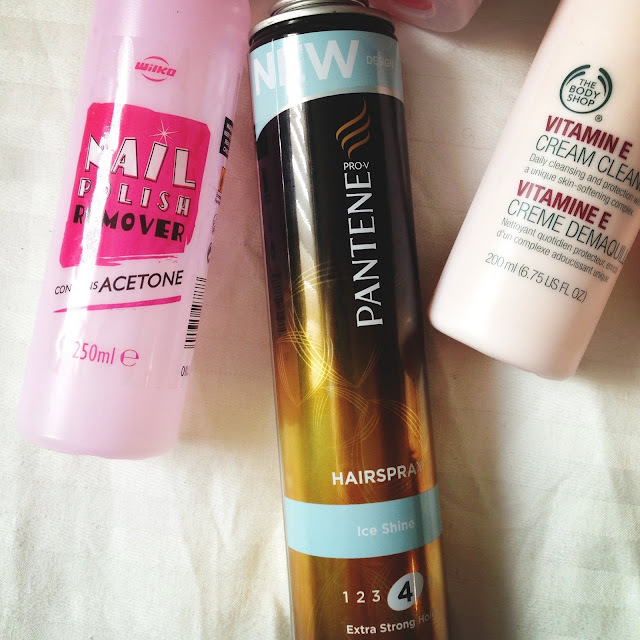 The Pantene hair spray is my favourite canned hair spray as it can set your hair, add volume whilst also being easy to brush out. It keeps my curls in all day and for the day after when they are brushed out, so I always keep repurchasing this. This nail polish remover I have had for years and I’m pretty sure it was from Wilkinsons as it says Wilko on the bottle. Im assuming therefore that it was super cheap. But it was amazing at taking off nail polish really fast. Of course it contains acetone which some people dont like, but if you’re after a cheap nail polish remover that works quickly, this was a gem. 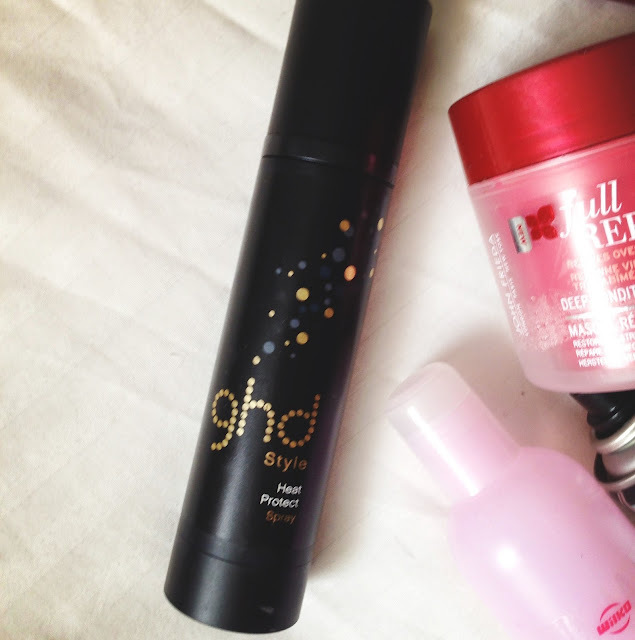 And finally, the ghd heat protector spray. I have repurchased this and love using it. I spray it all over my wet hair after showering, before drying it. I will then add more to each section of hair if I choose to straighten or curl it and it has definitely kept my hair looking and feeling much better. It also last for ages, so the price is definitely justified. What are your recent empties? Any similar to these?